Survivor: Africa (2001) - 9th place, 8th out - 1st juror. 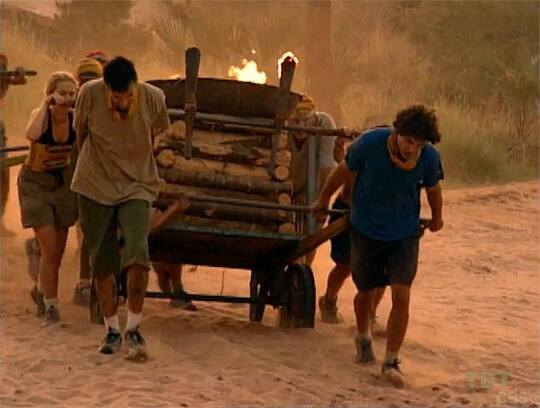 Voted out in Episode 8, "Smoking Out the Snake" (Day 24). Africa Ep. 1 RC/IC: "Trail Blazer" - Helps push the Boran cart. After Diane's late-stage collapse, Boran loses. Africa Ep. 2 RC: "Stairway to the Stars" - Helps carry poles, but this time Kim J falls; Boran loses again. Africa Ep. 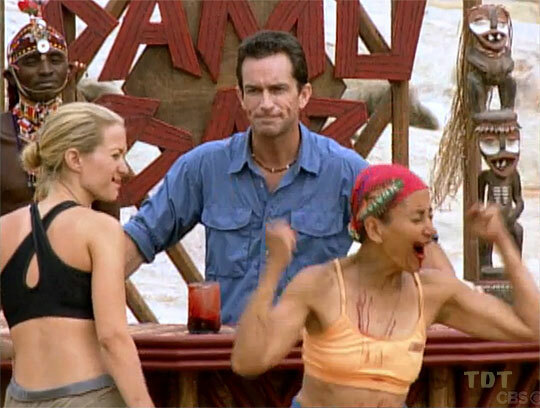 2 IC: "Safari Supper" - Drinks her first-round shot, but loses to Linda in the tie-breaker. Boran loses. Africa Ep. 3 RC: "Rock 'n Roll" - Gets rolled over by a giant boulder, but Boran wins! Africa Ep. 3 IC: "Distress Signal" - Boran wisely uses an open area for their SOS, and Boran wins! Africa Ep. 4 RC: "Caught in the Web" - Matched up against Teresa, and thanks to Kim J, Boran loses. Africa Ep. 4 IC: "Movin' on Up" - With Kim J acts as a non-carrying "architect"; Boran wins! Africa Ep. 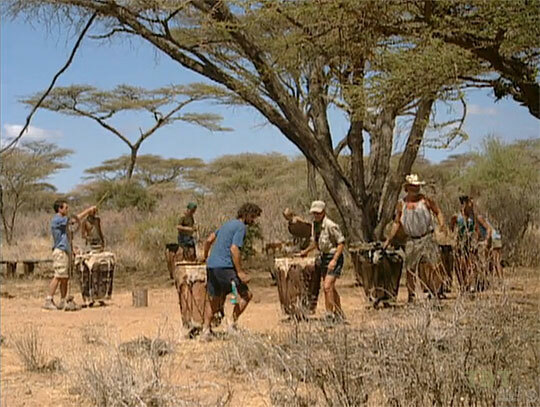 6 IC: "Spear-It Hunt" - Sits out, Samburu loses. Africa Ep. 7 IC: "When It Rains, It Pours" - First person out, just 14 minutes in (10th/10). Africa Ep. 8 RC: "Stomp-ede" - Unable to make her plank catapult more than 1 item, dead last again (9th/9). Africa Ep. 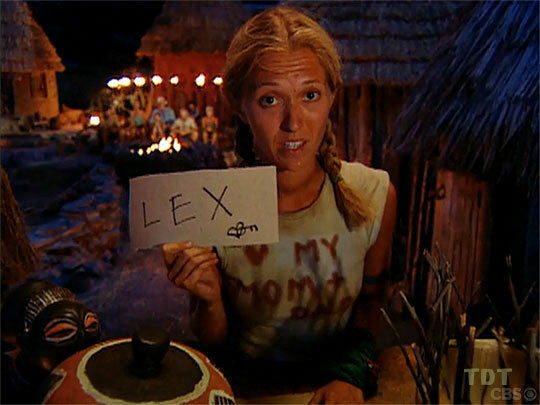 8 IC: "Box Your Mind" - With Teresa, eliminated on the second item (tie-5th/9). Africa, Ep. 2: Jessie Camacho (voted out, 5-2). Africa, Ep. 5: Silas Gaither (voted out, 5-1). Africa, Ep. 8: Five votes, from Ethan, Kim J, Lex, Big Tom, and Brandon (voted out, 5-4). Africa, Ep. 13: Voted for Ethan Zohn, who won, 5-2. CBSNews.com (12/7/01): "Kelly Cast Out"
Jessica Shaw at EW.com (12/14/01): "Kelly shares the dirt on Lex and Ethan"
SurvivorOz podcast interview (4/1/14): "Kelly Goldsmith Interview"
"Born in San Diego, California, Kelly Goldsmith attended high school at La Jolla Country Day School in California. During those four years, Goldsmith served as class vice president, class president and student body vice president. She was also a varsity cheerleader, class homecoming queen and a National Merit Finalist (having scored 1520 on her SAT). Graduating from Duke in 2001, Goldsmith recently started a new job as a behavioral research analyst while she decides where to apply to graduate school. She has previously worked as a research intern for a cosmetic company and a chief researcher for a website company. Her hobbies include lifting weights and crocheting. She also enjoys singing and performing, having won the role of Abigail Williams in the 2000 Duke Drama Play The Crucible. An avid traveler, she has visited over thirty-five countries. Kelly Goldsmith has one brother, Bryan. Her parents, Lyda and Marshall, have two dogs, Mandy and Beau. Her birth date is April 27."